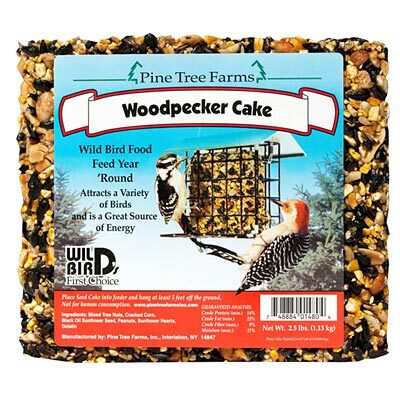 Show your appreciation for woodpeckers by feeding them the Pine Tree Farms Woodpecker Seed Cake. This large cake has all of a woodpecker's favorite foods, such as peanuts, cracked corn, and sunflower hearts, for a delicious avian treat. The mixture of ingredients has a wealth of protein and fat, enabling birds to maintain their high energy levels. Gelatin holds the cake together, for a great alternative to loose seed feeding. Rest this block on a platform feeder, or place it in your existing Pine Tree Farms All-Season Large Hanging Wire Bird Feeder (not included) for birds to enjoy it. Celebrate woodpeckers by offering them their favorite foods in this Woodpecker Seed Cake. Made in the USA. Note: This case pack contains 8 Pine Tree Farms Woodpecker Seed Cakes, 2.5 lbs. each.